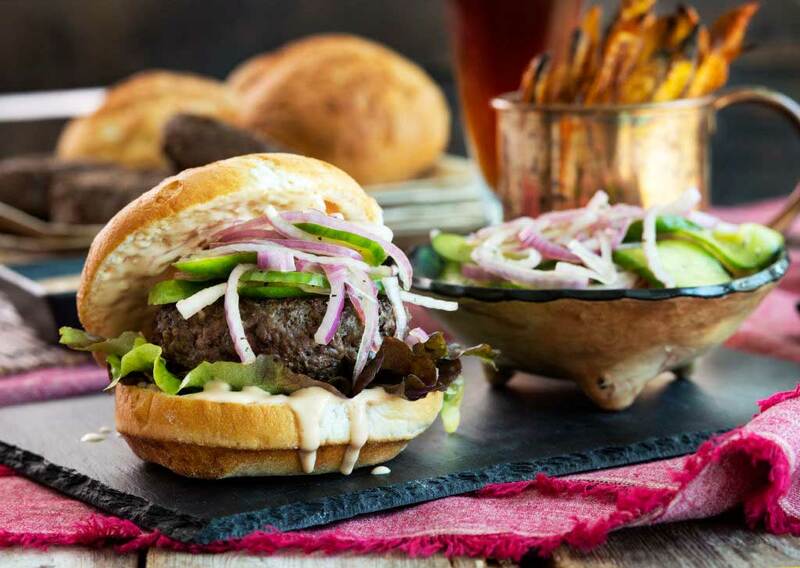 This recipe takes the American hamburger and infuses it with a boost of Asian flavor featuring Marukan Premium Soy Ponzu with Yuzu Citrus. Combine the vinegar, ponzu, sugar, salt, and pepper in a small mixing bowl. Whisk until the sugar is dissolved. Add the vegetables and let sit while preparing the sauce and burgers. Combine the beef and ponzu sauce in a bowl. Mix with your hands, just until well combined. Divide into four equal portions, then form into patties. Using your thumb, create an indentation on the top of each patty. Season the patties on each side with salt and pepper. Then heat the oil in a large skillet over medium heat. Cook on one side for 5 minutes or until browned. Flip and cook for another 5-6 minutes for medium rare.